Here we are again, off to Crufts to sell our luxury dog beds in hall 5, stand 56. Every year we pack a huge trailer and a huge van full of our best dog beds and drive from Aberdeenshire to Birmingham to sell to the dog owners waiting for us to arrive at NEC. It is a very, very busy time and it is delightful to meet so many of our fans and new customers. We constantly have visitors who bring a friend to show them the Tuffies stand. It’s hilarious how they will go and show the friend all the wonderful waterproof dog beds and tell the friend about all the benefits of the product and finally get the friend to buy one for his or her own dog. Other visitors to the stand sometimes listen in and get all the information that they need straight from the horse’s mouth as it were. It is of course a far more credible and true assessment of how great the dog beds are when it comes from a complete stranger, who simply love the large dog beds for their own Great Dane or maybe some of the small dog beds for the pack of toy dogs that they own. To be honest we even sometimes hear some new Unique Selling Points from our own, old customers when we hear them talk to friends. It is also funny to witness how some devoted customers know the web site inside out. They will often tell their friend how to get to a certain product, for example how to get to the luxury dog beds by going down the Shop page till you see the right one and then click in. How to see the possible colour choices etc etc. 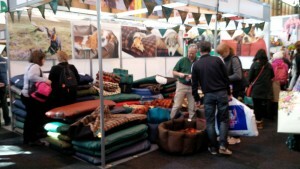 The need for chew proof dog beds and the excitement that it is actually possible to get a nice, warm, padded chew proof bed is overwhelming when you are at Crufts and speak to customers. Chewing dogs is a terrible problem everywhere and they might be large dogs or just small dogs, but if you have a chewer, you will know all about it and the frustration builds up when you yet again spend bad money on dog beds that will just be chewed. Luckily, Tuffies has the only warm, pleasant chew proof dog bed with inter-changeable covers on the market and it’s such an important solution to those unfortunate dog owners that are faced with the problem. Sometimes prospective customers don’t believe it when we tell them the benefit of the chew proof dog beds with interchangeable stuffing, but when other customers are in the stand, they turn round and say that it is actually true that the beds are chewproof. It is also important to go to shows to tell everyone that it is ONLY the Really Tough Tuffie that is chew proof and not any of our other strong and durable dog beds. Strong and durable is very different from chew proof and it is sometimes a difficult message to get across to someone who in their own mind WISHES that our beautiful dog beds are all chewproof. The fact is, that dogs can chew anything that you can cut with scissors and that’s the end of the situation. See you all at Crufts, we look forward to seeing all the known faces and to meet new ones that you bring along to see our fantastic dog beds. On the yearly trip to France to ski, one's eyes are always out for DOGS and hopefully also for <a href="https://www.tuffies.co.uk/">dog beds</a>. First thing that happened, however, was that I stood in a pooh. 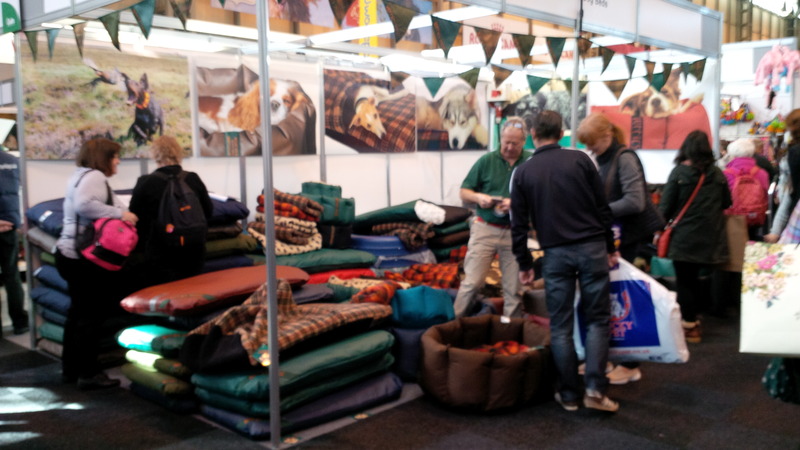 It has alw..
We had a fantastic four days selling <a href="https://www.tuffies.co.uk/">dog beds</a> at Crufts 2016, only last week. It is a delight to meet so many Tuffie fans, even when it is only to come round to us and wish us all..